Your control panel can help you keep track of your transactions and clients, as well as easily send leads. When you log in to your account, you’ll land on your dashboard. Along the top, you’ll see the total amount of contributions processed since your account was opened, total number of transactions made, and the average gift size. Below those numbers, you’ll find a graph detailing the amount of contributions from one-time donations, events, and recurring donations. You can change the time frame by using the calendar fields along the top of the graph. The My Clients area of your control panel contains a list of every organization you work with. There are two ways to display your client list. At the top-right of the screen, you’ll see a toggle. When the toggle is set to the left, your client list will appear in tile format, as shown below. When the toggle is set to the right, your clients will appear in list format, as shown below. You can search the list of organizations by name using the search tool located next to the display toggle. You may also choose to display only active, only inactive, or all organizations by using the buttons in the same location. If you don’t click either button, all accounts will be shown. In tile mode, hover over an organization to display a pop-up detailing if the organization is active or not. In line mode, the green toggle indicates an organization is active. 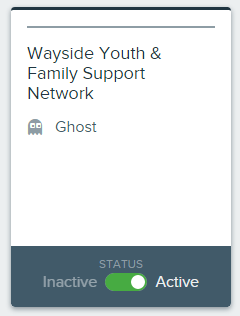 You also have the ability to ghost any organization on your list by clicking the Ghost icon next to the organization name on the My Clients page. Ghosting allows you to see the organization’s control panel as an administrator. You can make changes to an organization’s settings while you’re in ghost mode; just be sure to save your changes before un-ghosting (just click the ghost icon in the upper-right corner of the screen to do so). In the statements section, you’ll find a statement summary and a list of individual organization statements. When you click Statements, you’ll automatically be taken to the current month’s statement summary. If you’d like to view previous months’ statements, use the drop-down menu found in the upper right corner of the screen. You can also search your list of organization statements by organization name using the search bar. Your summary statement (along the top in the below image) shows you the total amount of transaction fees, recurring fees, and setup fees earned for the statement period. Organization summary statements (shown under Statements by Organization in the below image) show the amount of total transaction fees, recurring fees, and setup fees for the statement period. If you’d like to download a statement, you have two options. To download a summary of your statement containing the basic information appearing on the statement summary screen for each organization, hover over Summary Statement along the top of the screen and choose if you’d like to download a .csv or Excel file. To download a more detailed statement that includes donor names, payment type and status, transaction amount and fees, and donation source, hover over Detailed Statement and choose your file type. Here, you can add a new user or manage existing users. To add a new user, click the Add New User button and fill out the necessary information. The user system is invitation-based, so your new user will receive an email prompting them to set a password and log in to the system. They will be marked as a pending user until they do so. If you’d like the user to be able to receive notifications, toggle on that option. If you’d like to change the information for a user who is already in the system, click Edit next to the user’s name. You can also send a reset password email if needed. You can remove users at any time. In this area, you can update your personal information and the name of your organization. If you’d like to send a lead, simply click Send Lead on your control panel. You’ll be taken to a form where you’ll enter some basic information and details about the lead type. To read about the Send Lead form, check out this help desk article. If applicable, you may need access to our API reference guide; clicking API on your control panel will take you there! You can also view the guide by clicking the hyperlink below.